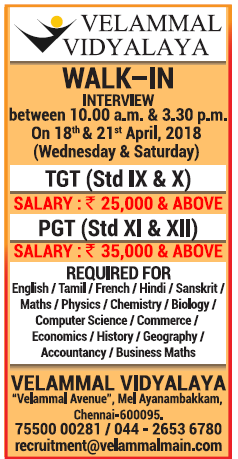 Velammal Vidyalaya, Chennai has advertised in THE HINDU newspaper for the recruitment of PGT plus PRT job vacancies. Interested and eligible job aspirants are requested to appear walk in on 22nd April 2018. Check out further more details below. About School: Velammal is synonymous with quality education from KG to PG. To meet the growing academic challenges globally, Velammal Educational Trust (VET) at Chennai and Madurai along with Veeramakali Memorial Welfare Trust (VMWT) & Ramana Educational Trust (RET) are determined to run the institutions under its tutelage, professionally, adopting all the modern advancements in academics and technology,to shape the individuals into truly global citizens with human values.